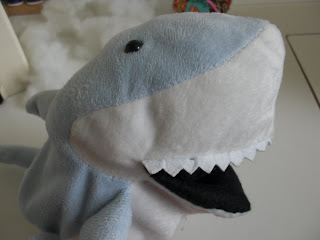 Today I want to show you a very easy, very inexpensive way to make a puppet out of a stuffed animal. This is a project you can do sitting on your couch, and without fancy-schmancy equipment! Step One: Gut your stuffed animal. (From here on I will refer to this guy as "Bruce," which is what Buzz calls him.) You want to cut open the spot where you want your hand to go in. For Bruce, it is right under his belly. 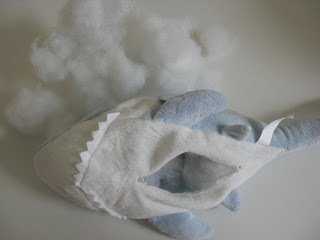 Remove enough of the stuffing to get to the place where you will make his mouth. Step Two: Cut an opening for his mouth. 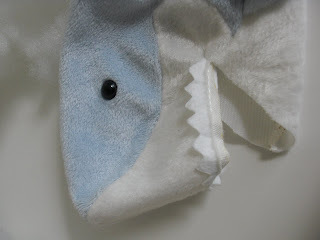 I cut just below Bruce's teeth, leaving a small seam allowance so I will have a place to sew the inside of his mouth. Step Three: Cut a rough diamond shape, larger than what the finished size of the inside of his mouth will be. 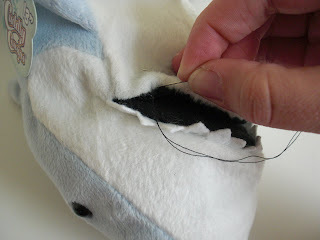 Step Four: Start stitching the inside of his mouth to the top of his mouth opening. I just shifted it around as I went to make it nice and flat. I turned the edge under as necessary to make it fit right, and also so no raw edges were left exposed. Step Five: After attaching the top of his mouth, pin the other half of the mouth diamond to his jaw. Open and shut his mouth to determine that it will look right when he is talking. 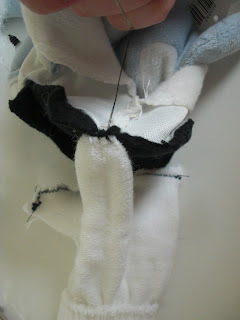 Sew the same way you did in Step Four. He has a jolly, grinning mouth! 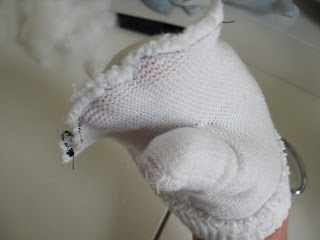 Step Six: If you are using a glove, turn it inside out and cut off the fingers far enough to ensure there is just one giant hole remaining (not four small ones!). 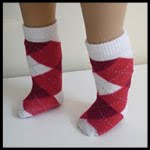 If you are using a sock, the heel of the sock is where your thumb goes, and the toe is where your fingers go -- skip to Step Eight. 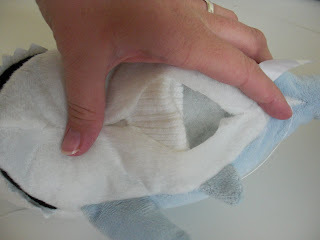 Shift your glove around so that the thumb is in the middle. 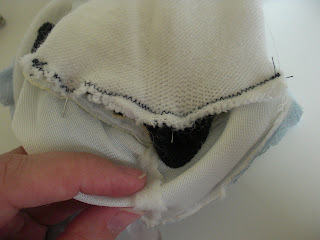 Step Seven: Sew the opening shut. 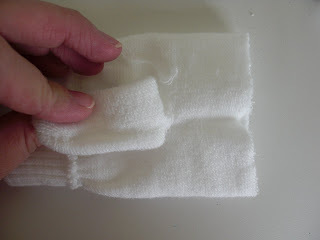 You really can do this part by hand, but I used my machine (zig-zag stitch) because I was in a hurry. Now you can see the puppet-talking action! 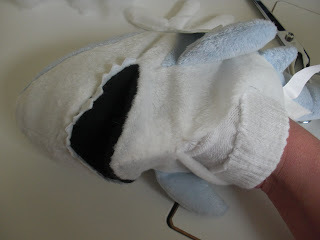 Step Eight: Turn your puppet inside out and line up the thumb of your glove to the center front of his jaw and stitch. 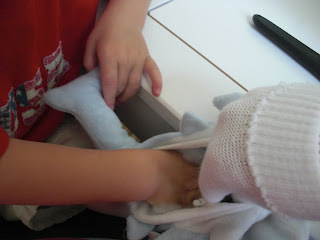 Step Nine: Turn him right side out and put your hand inside the glove. I stuffed just the top part of his head so I could get a better idea of how he would operate. 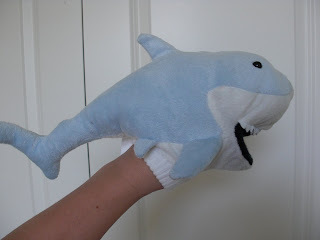 Open your hand as far as you can and carefully pin the very back of his mouth to the middle part of the glove. 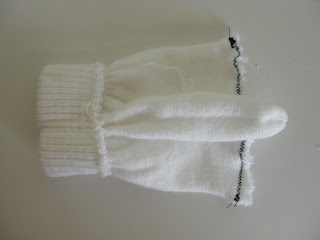 (Since the fingers of the glove are not there, the middle part of the glove shouldn't be able to reach your hand when it is stretched open.) 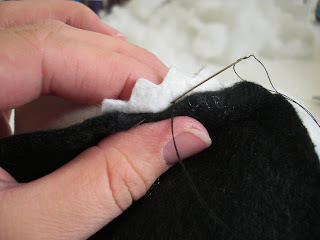 Turn the puppet (but not the glove) inside out again and stitch where you pinned. 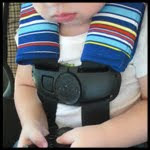 Step Ten: Turn him right side out again and put your hand inside! 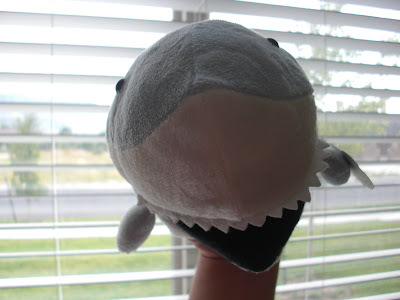 This time you are going to pin the top of his mouth to the ends of the glove where your fingertips are. Be careful!! If you go very slowly you will be able to feel the pin without stabbing yourself with it. 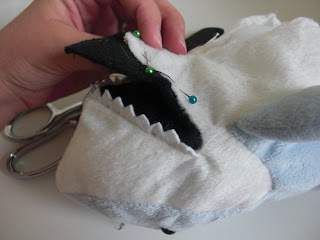 I pinned it in three places to ensure the glove will stay in place while Bruce is talking. 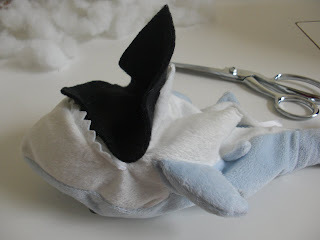 Again, very carefully turn the animal inside out (but not the glove!) and stitch in the places you've pinned. 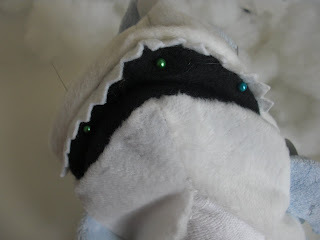 Step Eleven: You are ready to re-stuff your new puppet! This works best when your hand is already inside, so it might be good to enlist a little helper, as I did, to help get the job done. 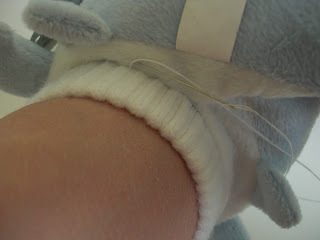 Step Twelve: Cut a slight curve in the bottom of the stuffed animal so it will conform to your wrist a little better. 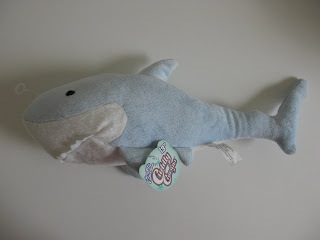 Step Thirteen: Place your hand inside, and stitch the glove to the bottom of the stuffed animal, turning the edge of the animal under just a bit as you go. I love how he turned out; he's just so jolly!! 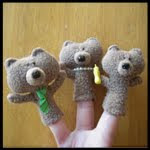 Now, if your stuffed animal is something that isn't conducive to cutting in a mouth -- say, a bear -- you could still turn him into a puppet. Cut the "inseam" of his legs -- from inside ankle, up around his crotch, and down to the other ankle. Also cut off his feet. You will reconstruct him with the front pieces of his legs attached, as well as the back pieces of his legs, so that there is one opening at the bottom. Then you will unstuff him up to his midsection, and use a glove with the pinky in one arm, the thumb in the other, and the three middle fingers in his head. He won't move his mouth, but he'll be great at sign language!! I just keep hearing in my mind "Heeeerree's Bruce-y!!" What a stinkin' cool idea!! I'll be featuring today. Putting the glove in is such a great idea! 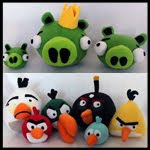 What a fun way to save those old stuffed animals. I'll definitely be trying this. This is such a great idea and I can't wait to try it. Brilliant minds think alike. I was just going to start playing with a mouth option for mine also. Now I don't have to think it through I can just do what you did. 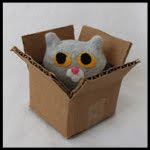 You will have to take a peek at my puppet theater too. This is fabulous! I've been seeing this all of the blogs today and I would love to link to it as well if you didn't mind. Yay for all your features! You rock! Another great project!! I just love reading your blog! 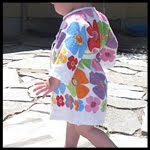 I left you a "one lovely blog" award on my blog. 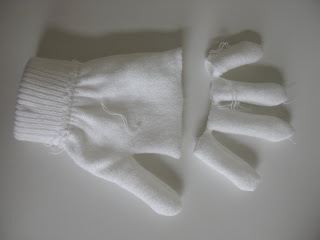 Wouldn't it be easier to use a mitten instead of a glove? Thank you for this tutorial. Seriously, my kids just got the most amazing puppet theater from their grandpa and I have always hated their stuff animals. Now I can put them to use. Did you know that you can create short links with Shortest and make cash for every visitor to your shortened links.